The onahole comes with a phial of lubricant. I like it very much, but it dries out qickly. The onahole smells barely noticeable. 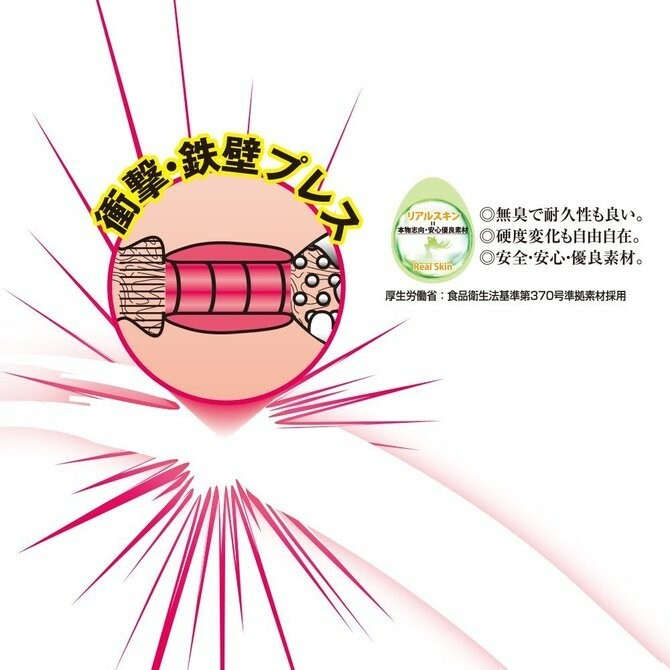 The special feature of this onahole is a tight tube in the middle of the tunnel that adds pressure. The sensation was great until it tore after first use. Even then it added sensation as a nub in the tunnel until the third cleaning flushed the tube out. The tunnel has some structures, but it is wide. By squeezing the onahole during use the sensation increases. Without the tube the onahole is made of only one material. This means it can be turned inside out for very easy cleaning and drying, which decreases the maintenance time significantly. Pretty easy to clean after the tight tube fell out, has to be squeezed for more sensation. Decent Gimmick, but short lived and slightly pricey. Smell is present even after one month, but can be masked with baby powder or fragrance of choice. Not very loud and does not leak lube unless you squeeze it very hard to make a vacuum. the front part of the hole feels way better than the end in my opinion, and for 2590 yen (sale) its okay, but I wont get it at the original price of 4100 yen.